Sariska National Park is a wildlife heaven full with exotic varieties of animals birds, reptiles and many historical sightseeing. Sprawling over an area of 800 sq km with a core area of 500 km on Aravalli range in Alwar district, Sariska has been has been the original hunting ground of the princely state of Alwar. Maharaja Jai Singh and today, thousands of tourists come here to watch tigers. You will find number of luxury as well as economy class resorts and hotels. 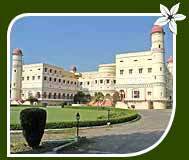 The erstwhile royal hunting lodge of Maharajah Jai Singh of Alwar, Sariska Palace is a grand heritage hotel located at the entrance of the famous Sariska National Park. Built at the close of 19th century, this palace turned hotels is itself a feast to the tourists. Sariska Palace has 80 lavishly designed rooms and suits with world class facilities including attached bath, telephone, running hot and cold water, refrigerator etc. Other amenities offered at the hotels are a multi cuisine restaurant serving Indian, Continental and Chinese cuisines, a bar offering both Indian and imported spirits, a swimming pool, tennis, squash and boating, Ayurvedic health centre & health club, Folk music and dance entertainment at nights. The hotel also arrange leisure activities like wildlife viewing by jeep safari, bird watching, nature walks, camel & horse safaris, sightseeing tours and visits to the nearby villages. Located just 4 km from the Sariska Tiger Reserve, the Tiger Haven Sariska Resort is a beautiful luxury resort promoted by a naturalist & wildlife expert, Dinesh Durani. With an aesthetic and eco-friendly decor, this resort offers luxury rooms in cottage style with terracota stone roof. 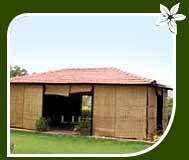 The resort is enveloped in a lush green ambiance with a sweet rural touch. Tiger Haven Sariska has 10 double-bedded rooms with attached bathrooms as well as hot and cold running water, attached bath/toilet, cable / movies, fan, phone, shower and television. It has a multi cuisine restaurant serving Indian, Continental and Chinese dishes and bar that offers both Indian and imported spirits. Other facilities offered here include Ayurvedic center, folk music and dance, travel desk conference hall etc. On your request, the resort offers leisure activities like wildlife viewing by jeep safari, bird watching, nature walks, camel & horse safaris, sightseeing tours and villages safari.